Organic chemistry produces a lot of useful substances, such as dyes, pharmaceuticals and advanced materials, on which we rely in our everyday life. However, prediction of properties of chemical substances is still very difficult. That is why chemists have to synthesize thousands of test molecules in order to find the one that fits. Fast synthesis is now achieved with the help of catalysts, which assemble several molecular fragments into one complex structure. The importance of such catalysts was recognized by the Nobel prize in 2010. A team of Russian chemists led by Prof. Dmitry Perekalin from Nesmeyanov Institute of Organoelement Compounds have recently developed a new rhodium catalyst for organic synthesis. The active center of the catalyst, the rhodium atom, is "wearing" an asymmetric "hat", which was constructed from three acetylene molecules. 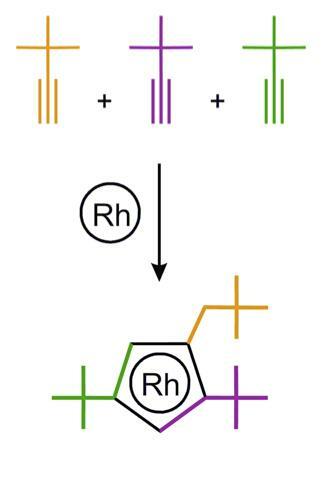 The molecules with left and right "hats" (which are mirror images of each other) were separated from each other with the help of natural "left-handed" amino acid proline. The asymmetry of this "hat" allows the catalyst to assemble the reacting molecules with full spatial control. The method is expected to help to synthesize new antifungal agents for agricultural industry. The discovered catalyst activates a carbon-hydrogen bond in the derivatives of aromatic acids and joint them with alkene molecules. This procedure converts monocyclic molecules to a tricyclic ones in a single step. Fusion of several rings make molecular structures more rigid and therefore they are more likely to fit as "a key" into biochemical "locks" of natural enzymes. Since it is possible to vary both aromatic acid and alkene component, the reaction can easily create 2500 possible "keys" from 100 initial reactants. Exploration of such asymmetric catalyst was initiated by researchers from Switzerland (Prof. Cramer from Lausanne and Prof. Ward from Basel) as well as USA (Prof. Rovis from New York), but now scientists from Germany, China and Russia has joined the field. The current challenge remains to make the catalysts cheaper by replacing the expensive rhodium metal with cheaper ruthenium or even cobalt. "Mainstream research tend to make catalysts more and more complex," Prof. Perekalin said. "Sometimes it goes beyond the common sense and the catalyst becomes more difficult to make than the reaction, which it is supposed to help with. Our idea was to go in the opposite direction – to make things as simple as possible. And this is one of the main reasons why we have discovered something new."